Danlee’s Disposable Economy Colonoscopy/Endoscopy Shorts - Item #ECOMOON Series are constructed of SMS (spun-melt-spun) trilaminate material which offers high tensile strength that is also soft, drapeable and easy to work with. 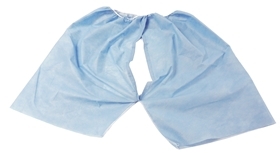 These disposable economy colonoscopy/endoscopy shorts are latex free and provide a fluid and particulate barrier without sacrificing mobility and comfort. Danlee's Disposable Economy Colonoscopy/Endoscopy Shorts - item #ECOMOON-S-L & item #ECOMOON-XL3X feature a simple access slit, located in the middle, extending from the top of the shorts down, making them ideal for colonoscopy and endoscopy procedures while allowing the patient to maintain his/her modesty. Danlee’s Disposable Economy Colonoscopy/Endoscopy Shorts - item #ECOMOON-S-L & item #ECOMOON-XL3X are made in the USA and available for purchase by case of (50). Note: This product is an economical version of item #H-MOON-50-S-L and item #H-MOON-50-XL3X: Adult XL - 3XL. This product is ideal for use in medical facilities that specialize in gastroenterology, urology, digestive disease, endocrinology and more. MADE IN THE USA!